The Dominican Republic economy grew rapidly throughout the 1990's. Sadly it has taken a few blows in more recent years. The Dominican economy ‘weathered the storm’, so to speak, of the devastating effects of Hurricane Georges in 1998. More profound effects have arisen since the turn of the millennium, due in part to the slow down in world economic activity, particularly in the U.S.
Mishandling by politicians and huge bank fraud during the recent tenure of Hipolito Mejia also impacted negatively upon the economy (see our Dominican Republic Modern History time line for more information). This has meant that growth has stalled in the last couple of years. Thankfully (we Dominicans hope) there has been a positive change at the 'top'. For many years the economy benefited primarily from the country being a significant exporter of sugar, coffee, and tobacco. In the last decade the service sector has overtaken agriculture as the economy's largest employer. The increase in wealthy businessmen and other well-to-do ‘settlers’ has further emphasised the fact that the Dominican Republic economy exhibits substantial income inequality amongst its inhabitants. The richest 10% of the population enjoy almost 40% of GNP. Conversely the poorest 50% of the population receives less than 20% of national income. Since 2000 low growth in the US economy, the source of nearly nine tenths of the country's export revenues, had adversely impacted on the Dominican Republic economy. Below we provide a summary of key Dominican Republic economic statistics, but if you really need to obtain more in depth economic and historical information then the online bookstore, Amazon, have some useful texts you might like to consider purchasing. Dominican Republic Economic & Social Statistical summary. Please click here the summary of social and economic information on the Dominican Republic. In 2012 President Danilo Medina was sworn in and proving popular with the electorate he was returned to the Presidency for a further term in the elections of 2016 after achieving an historic victory! "Danilo Medina Sánchez (born 10 November 1951) is a Dominican politician and President of the Dominican Republic, since 2012. 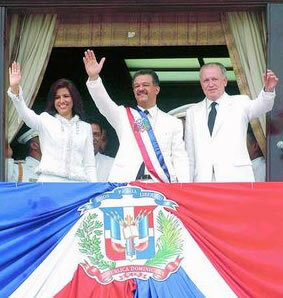 Medina previously served as Chief of Staff to the President of the Dominican Republic from 1996 to 1999 and from 2004 to 2006, and is a member of the Dominican Liberation Party (PLD). He won the May 2012 Dominican presidential election, defeating Hipolito Mejía with 51% of the votes. In May 15th 2016 Danilo Medina leading a coalition of parties won the 2016 Dominican presidential election, defeating the leader of the opposition and PRM candidate Luis Abinader with 61.8% of the votes, the highest percentage received by a president elected in free elections since 1924 when Horacio Vásquez won the presidency with 69.8% of the ballots—surpassing Juan Bosch's record of 59.5% obtained in 1962, and Leonel Fernández's 57.1% of the votes obtained in 2004." Things have not been completely trouble free, however, for although President Medina promised to fight long-standing corruption in the Dominican system he has received criticism from some political commentators that his efforts have not been successful enough, leading to a crisis of confidence in recent times.